The Harvest Right Small Freeze Dryer is small enough to fit on your counter top and features the ability to freeze dry large amounts of food in the comfort of your own home. Freeze Drying is more stable than dehydrated, bottled or canned foods, featuring a long shelf life of as much as 25 years, while preserving freshness, nutrition color and taste. • Great for use with Fruits, Vegetables, Meats, Dairy, Desserts or even full meals! • The average family throws away nearly $3,000 of food each year. Leftovers can easily be preserved and stored! • Even your favorite meals can be freeze dried: Lasagna, rice dishes, cheese macaroni, chili, beef stew, chicken a la king, casseroles, spaghetti, steak, pork chops, pasta sauces or even scrambled eggs! The possibilities are endless! 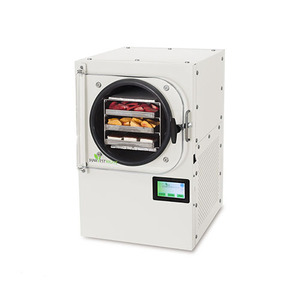 • Easily preserve produce from gardens and fruit trees with a home freeze dryer. • Create your own long term, emergency food storage! • Until now, canning and dehydrating were the best ways to preserve food for future consumption. However, both these methods have huge drawbacks. Canning is messy and takes a lot of time. Canning and dehydrating use heat, which greatly reduces the nutritional value of food. • In a year�s time, you can easily freeze dry 240 gallons of food. All of which will keep nearly 100% of its nutrition. 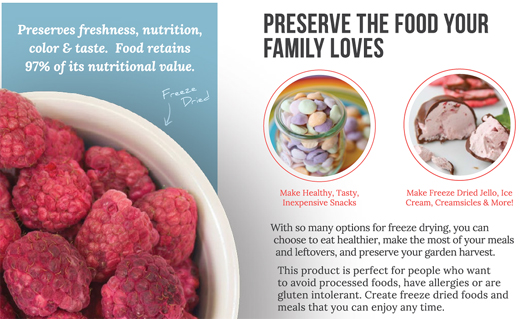 • Many families are prudent and purchase freeze-dried, prepared food from reputable companies. These products are generally good quality and are carefully packed, however, they are usually full of chemicals that may not be good for us. Get started the right way to preserving your food for up to 25 years with the Mylar Starter Kit for Harvest Right Freeze Dryers. In emergency situations can room temperature water be used to successfully rehydrate food? If so how much more water or time would be required compared to hot water? Also, how long is the shelf life of "snack" food in a jar being opened and closed ( as opposed to sealed with oxygen obsorber and left alone) ? In an emergency situation, room temperature water can be used to successfully re-hydrate the food. The amount of water and time needed will be nearly identical when re-hydrating. The average shelf life for "snack" food (food being stored in a container that is often opened and closed) is typically around 2 months or so. Once the food starts to become soft, it will be getting close to the end of its shelf life. Thank you for the inquiry! Is the dryer in the video the large one? The Freeze dryer shown in the video is the Standard size freeze dryer. The link to the product is as follows: http://www.earthtechproducts.com/standard-freeze-dryer.html Thank you for your inquiry!